There’s nothing my cats love better than Craft Day. Seriously. It’s like Christmas, catnip, empty boxes, felt mice and warm laundry fresh out of the dryer, all wrapped up into one glorious event. It could have something to do with the fact that my craft room/office is strictly off-limits to them without supervision, so they leap (quite literally at times) at the chance to enter the restricted area. 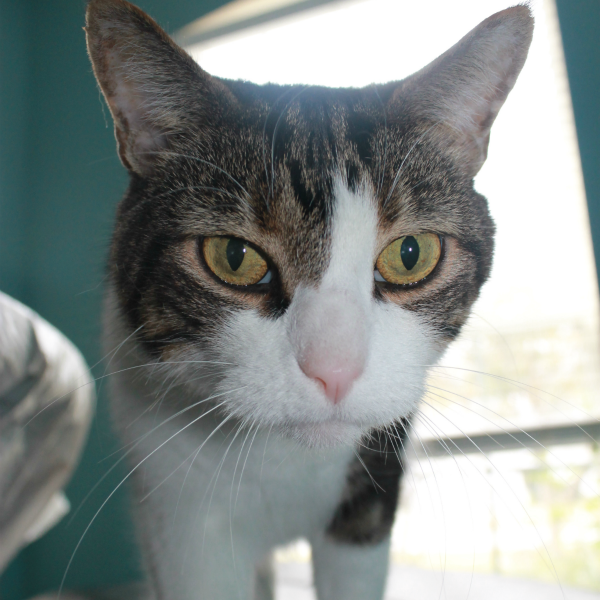 But it could also be because they’re also pretty social creatures (you may not have realized that about cats), so they look forward to opportunities to show off for our house guests. TicTac, pictured above, is the worst offender. Craft Days are a pretty special event for me too. They’re a chance to spend time with some of my girlfriends, catching up on life, the universe and everything, while trying (and figuring) new crafts and projects. We only had a couple in 2013, but we’ve resolved together to try to find time to have them more frequently. Last year’s projects included water-coloring, spray-painting plant silhouettes and sculpting little animal figures from polymer clay, and this year’s ideas are proving to be just as exciting. As you may imagine, a lot of our ideas come from projects or products we find on Pinterest, but they also come from things we stumble across in real life or on Etsy. 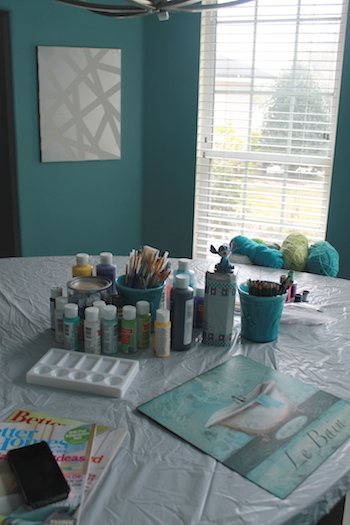 Steph stumbled across the first idea for our January Craft Day over at Apartment Therapy. 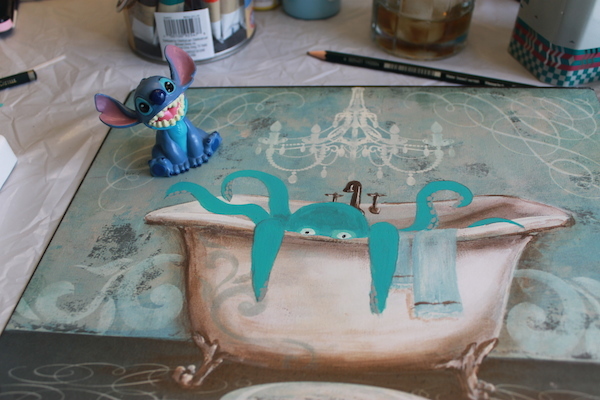 They had a blog that highlighted some artwork that someone had created for their home by adding monsters to thrift store paintings – brilliant! I’m not a great painter (mostly from lack of practice), but I fell in love with the idea and immediately went on the hunt for a painting. I found the little metal sign, pictured left, at the Goodwill by my house for a whopping $2.99. 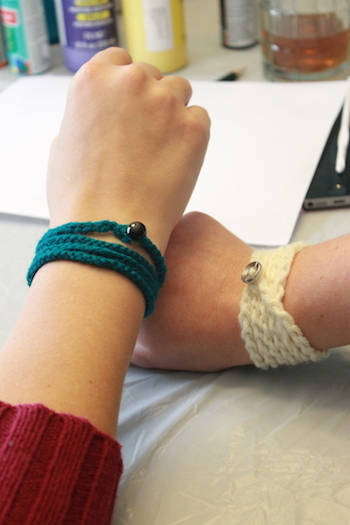 The second idea was to try our hand at crocheting our own version of these cute friendship bracelets. Steph found on Etsy. I love to crochet, so was definitely on board with giving this a try. Because they were a for-sale item, we didn’t have a step-by-step guide to follow, but thankfully we both knew enough about crochet to muddle our way through. The great thing about both projects is that between Steph and I, we had all the supplies we needed (minus the thrift store paintings) already on hand. That almost NEVER happens. 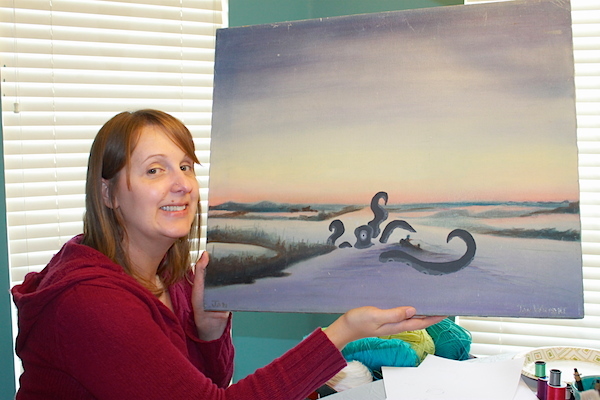 When Steph arrived, we wasted no time in jumping into to Project #1, and by some crazy happenstance , we both ended up purchasing watery-themed pieces, so had similar ideas of creating a kraken-like creature for our paintings. I absolutely LOVE how Steph’s kraken turned out, and the poor fisherman never saw it coming! I ended up painting a little octopus, who ended up better than I had hoped, which means that I’ve stumbled across a new hobby (like I needed another one), but I can’t help myself. I can’t wait to try this again! Stitch made an appearance after all the hard work was done (typical Stitch), but seemed to enjoy hanging out and getting to know Octavius (the little guy had to have a name after all). 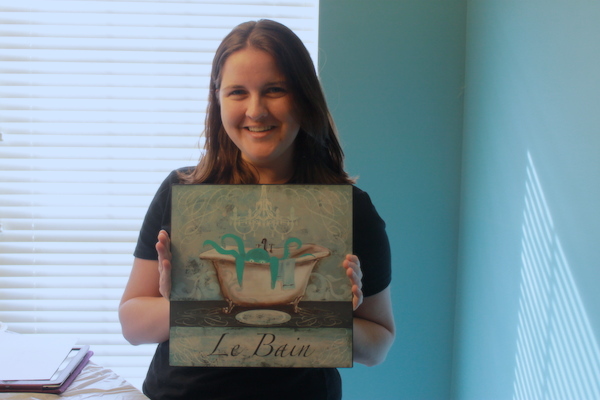 I was actually so excited about how the painting turned out, that I immediately hung it up in our guest bathroom. While our paintings dried, we started on the crocheted bracelets, which worked up much faster than I expected. We kept things simple by making one really long single crocheted chain, then sewing a button on one end to serve as a fastener. I didn’t have any charms on hand to embellish the bracelets with, but if I try this project again (which I very likely will) there’s a lot of versatility and customization to play around with – stitch styles, buttons, charms, yarn types and colors. And because we like to know where our next craft is coming from, we’ve already decided what to do for our February Craft Day. Steph found a pretty great (if daunting!) tutorial on how to make rustic, handpainted wooden signs that we’re dying to try. In the meantime, I’d love to hear what crafts you’ve tackled already this year. Share your favorites in the comments below!